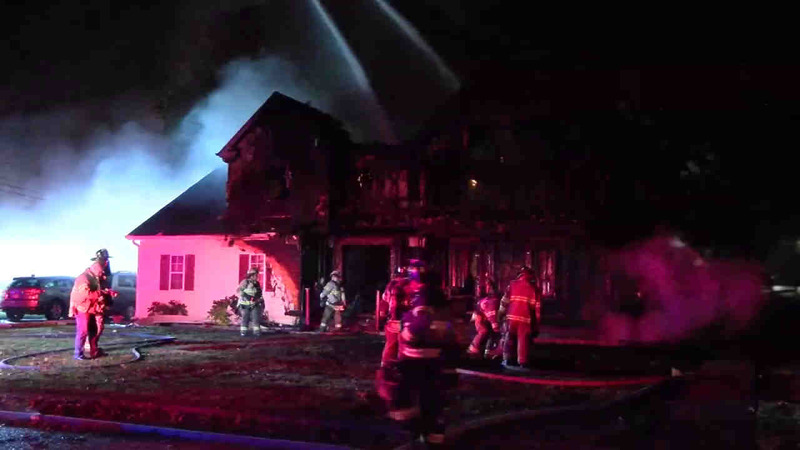 CENTEREACH, Long Island (WABC) -- An off-duty Suffolk County police officer helped rescue a family of four from a house fire in Centereach Friday night. Around 11 p.m., the daughter of the officer James Anson told him the house across the street on Minto Court was on fire. Anson went with a ladder to the second-story window of the house where a couple living there were screaming for help. The front of the house was fully engulfed. Anson climbed up the ladder and they passed their two boys, ages 7 and 5, to him, who passed them down to two other officers, who brought them to safety. The couple then climbed down the ladder. Two neighboring houses were damaged from the fire. A firefighter rescued one of the family's dogs; a second family dog died at the scene. Firefighters from Centereach, Stony Brook, Setauket, Coram, Selden, and Ronkonkoma fire departments responded. One firefighter suffered an ankle injury, and along with the family, was taken to Stony Brook University Hospital with non-life-threatening injuries.